user warning: Table 'drupalgastronomer.comments' doesn't exist query: SELECT COUNT(*) FROM comments c WHERE c.nid = 162 AND c.status = 0 in /home/dgabriner/gourmetgastronomer.com/modules/comment/comment.module on line 992.
user warning: Table 'drupalgastronomer.comments' doesn't exist query: SELECT c.cid as cid, c.pid, c.nid, c.subject, c.comment, c.format, c.timestamp, c.name, c.mail, c.homepage, u.uid, u.name AS registered_name, u.signature, u.picture, u.data, c.thread, c.status FROM comments c INNER JOIN users u ON c.uid = u.uid WHERE c.nid = 162 AND c.status = 0 ORDER BY c.thread DESC LIMIT 0, 50 in /home/dgabriner/gourmetgastronomer.com/modules/comment/comment.module on line 992. Last night I attended an underground dinner, in association with Forage SF, in which our meal focused on wild foraged foods. Living in the pacific northwest, we have a bounty of naturally occurring ingestible & medicinal plants ... in addition to the proverbial weed. Our lecturer taught us about a variety of weeds: dandelion, plantain, something I can't recollect, and stinging nettles. Not only are these plants edible, they also have medical properties. The plantain leaf is commonly called the "band-aid plant" and can reduce inflammation. For example, if applied topically, it can help to reduce symptoms of rheumatoid arthritis. It also has the curious side effect of making you pee pee. This talk intrigued me for its intellectual and holistic value, but moreover because I love free things and any chance to spite my diminishing wallet is one I shall spearhead! As a reward for my curiosity, I was graciously given a plate of stinging nettles. This morning I found myself sniffing around my backyard, giddy as a fat kid at Sizzler's, grabbing at Miner's lettuces. The pouring rain was inconsequential in comparison. For the purpose of my tummy and this post, I wanted to focus on the stinging nettles and how I used them in this super simple pasta dish. For other articles on foraging, please check out my friend Jacky's article on Chefsblade. "Yeah, people found out that the nettles stung a bit and started using them for sexual practice." .... what? Did I miss something? Aren't we supposed to be living in fear of those such rashes? Didn't anybody see Ratatouille? If not, check out this video. Because they are pulpy, nettles work well in soups or sauces. For the ravioli pasta I made a hybrid. The sauces is loose, but thicker than soup. For protein I used some egg. 1. In a large pot (4-5 quart) of boiling salted water, blanch the nettles for 3 minutes. Do not drain the water. Instead, remove the nettles with tongs, and set aside. Keep the water roaring. It will be used later to cook the eggs, followed by the ravioli. 2. Boil the eggs - hard boiled style. For further instruction, click here. 3. As the eggs boil, heat the olive oil in a medium size saucepan. Add shallots and saute on medium until translucent. Add chicken broth. Bring to boil. Add blanched nettles. Reduce by one fourth. 5 minutes. Remove from heat and give it a douse of olive oil. 4. Seven minutes before serving, boil the ravioli as directed by package. Drain. 5. 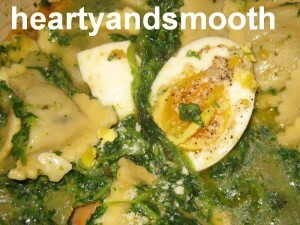 Divide the nettles into 4 bowls, add ravioli and egg quarters. Garnish with cheese, salt, pepper, and more olive oil. 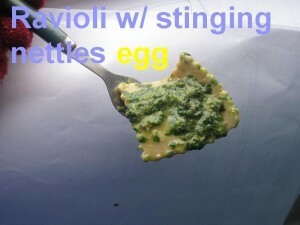 For more pics, got to kitchensidecar.blogspot.com.